Educational Archives | "Global Possibilities"
Recognizing the tremendous worldwide influence of the National Media, GP began an innovative partnership with entertainment industry professionals organizing a series of Hollywood Writer’s Briefings along with one-on-one meetings with producers, writers, and heads of studios to encourage integration of climate change and solar energy messages into television and film scripts. The goal was to use television and films to educate people throughout the world about the very real threats of global climate change and the benefits of solar and renewable energy technology as a solution. As Chairman of the Board of Directors of EMA, Casey Coates Danson was able to develop a partnership to produce a Hollywood Writers’ Briefing: “Too Hot For Television” on Global Climate Change held in Los Angeles on January 13, 2000. Norman Lear founder of EMA hosted and Ms. Danson introduced keynote speaker, Donald W. Aitken, Ph.D., Senior Scientist with the Union of Concerned Scientists, who delivered a slide presentation establishing climate change issues particular to Southern California. Subsequent meetings with writers, producers, studio heads and production facilities were scheduled on an ongoing basis. The practical application of solar design was highlighted in the Jan/Feb 2000 issue of Natural Home magazine featuring homes designed by Casey Coates Danson which demonstrate the use of integrated photovoltaics and daylighting principles. House Beautiful, the Television Series, filmed Ms. Danson’s 95% solar home (the largest residential installation in Los Angeles) for its “Natural Environments” segment airing on A&E Network beginning in October 2000. To promote GP’s mission of designing buildings with solar energy to mitigate climate change, Ms. Danson developed a presentation, titled Architecture and Climate Change for the Bioneers 2000, Revolution from the Heart conference. GP and the American Solar Energy Society (ASES) organized the National Home Tour 2000 in Southern California. The successful first tour opened eight homes to the public demonstrating real people living in real places. An in-depth interview with Ms. Danson appeared in the Los Angeles Times October 13, 2000 to supplement the tour that brought out over 500 participants. Ms. Danson was interviewed for the Czechoslovakian “home style” magazine,Streche (Roof) for European distribution. GP participated in the new Discovery Health channel’s “Healthy Homes” a twenty-six part series on living and working in a healthy environment. A segment focused on daylighting principles was highlighted with her 95% solar powered home designed by Ms. Danson where she lives and works. Global Possibilities (GP) and the University of California, Santa Barbara co-hosted the “Critical Issues in America” Program: U.S. 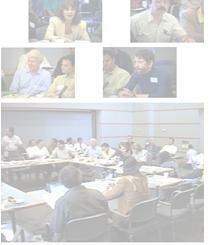 Solar and Renewable Energy Policy Symposium in May, 1997. Leading experts from government, utilities, business and environmental organizations examined renewable energy markets, the current business climate including transportation and land-use planning, and technology development. The symposium addressed the current “back-burner” status of U.S. energy policy toward the development and implementation of solar and other renewable energy technologies. The final consensus among participants was the need for education and a common language. GP and The Earth Group, a New York based design collaborative co-hosted the Second Annual Symposium for a Solar Future in conjunction with the Cooper-Hewitt’s “Under the Sun: An Outdoor Exhibition of Light” in October, 1998. Approximately forty deans, chairs and professors from U.S. architectural and design schools gathered together to develop an educational strategy to enlist all design schools in an effort to create a more sustainable future for the planet. The symposium launched Global Possibilities’ long-term National Education Initiative for a Solar Future. Based on the symposium proceedings and research, Global Possibilities and the Earth Group created curricula and educational tools (that accommodate regional climate change differences) to be utilized by national design schools. GP and the Earth Group hosted Regional Climate Change Conferences with deans and chairs of architecture schools co-terminus with the 18 U.S. Global Change Research Program (USGCRP) climate regions to develop regional curriculum and resources. Some of these meetings coincided with the Smithsonian Institution’s “Under the Sun Exhibition” which traveled to locations in the U.S. The Southeast and Mid-Atlantic Regional Conference was held in Washington at the Smithsonian Institution on June 25, 1999. East and Midwest Region “Design Education and Sustainability: A Prototype for Developing Green Curriculum” – October 1, 1999. The East-Midwest Regional workshop held at Ball State University’s “Greening of the Campus III” conference on October 1, 1999 in Muncie, Indiana, reviewed the results to date of Global Possibilities’ Symposiums for a Solar Future, and interactively demonstrated the methodology used to organize the curriculum developing tools, i.e. the national and regional conferences, the focus questions for discussion, and the protocols for collaborative group discussion. Environmental leaders David Orr, Robert Costanza, Hilary French, Susan Flader and John Ryan were keynote speakers at this “Greening of the Campus/Curriculum” conference. The California Regional presentation was held at the 88th Annual Conference of the Association of Collegiate Schools of Architecture “HETEROTOPOLIS: Immigration, Ethnicity, and the American City” on March 11, 2000 in Los Angeles, California. This Special Interest Workshop explored the potential role architecture and architectural education can make in modulating the rate of climate change and its social effects. The City of Los Angeles and the surrounding region served as a case study. An interactive session allowed participants to use a curricular-generating methodology that is transferable to any region. As a result, participants can hold workshops in their own colleges and universities on the subject. Similar to “Rethinking Design Curriculum,” GP organized real estate brokers, developers, business leaders, business schools, and like-minded non-profits to address the economic and environmental benefits of solar energy as it relates to business, property and land-use/management, promotion, and education. The objective of Project II is to educate business on their essential role of utilizing solar energy and renewables to create a competitive energy market and a sustainable business environment. Our first Building Technologies Conference “Increasing Profits Using Sustainable Technologies” was held in West Palm Beach on October 7, 1999 for real estate brokers. Our Keynote Speaker, Donald W. Aitken, Ph.D, Senior Scientist, Union of Concerned Scientists, presented a slide show and talk on the importance of the built environment and ways we can use modern sustainable design technologies to use resources more efficiently and mitigate climate change. Other speakers included Casey Coates Danson, Dr. David Benjamin, University of Florida, who discussed the elements necessary to create communities that nurture their inhabitants on a long-term basis and work in harmony with the environment. “Design for Climate” was the subject of Kaizer Talib, A.I.A, President, Urbanform Design, and Dr. Pierce Jones, University of Florida, discussed cutting edge building construction methods and materials which mitigate climate change, from energy use, windstorm damage, helping to decrease maintenance, insurance and financing costs.